Featuring rugged construction and user-friendly design, this Remington 14-inch electric chain saw is designed to provide high performance. It comes equipped with a 1.5 peak horsepower motor and a 14-inch low kickback bar and chain, making it powerful enough to get your cutting jobs done. Its wraparound hand guard delivers added protection, and the trigger lock-off is designed to prevent accidental starting. This Remington RM1415A 14-Inch 8-Amp Electric Chain Saw also comes with a push button oiler and an external adjustment screw for chain tensioning. And compared with gas-powered tools, the electric chain saw is more environmentally friendly since it requires no gasoline or oil to mix and won’t cause air pollution. 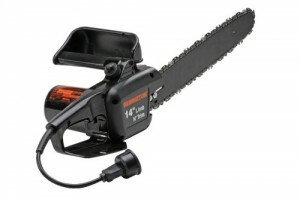 The Remington Electric Chain Saw features a lightweight design while delivering maximum power. So just take on your next cutting or trimming tasks without stopping this unit. Additionally, this low kickback chain saw comes equipped with an easy adjustment screw to accurately tension the chain in a matter of seconds. Comes fully assembled and backed by a 2-year warranty.